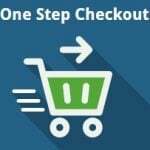 We’ve just reviewed Amasty One Step Checkout, and now it is time to compare it with another reliable OSC solution for Magento 2 – Magestore One Step Checkout. Both tools combine all checkout steps on a single page and provide a bunch of features that improve the default procedure even more. So, below, Amasty and Magestore get to close quarters. If you are looking for the best Magento 2 one step checkout extension, check this post. Unfortunately, the Magestore Magento 2 One Step Checkout extension is no longer available. 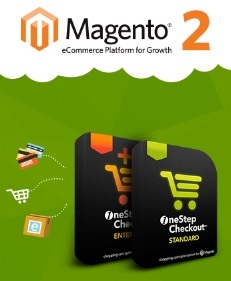 However in the meantime, the Original OneStepCheckout company released their extension for Magento 2. Based on their success on Magento 1 and reputation we strongly advise you look at their solution as it’s been trusted by close to 500 Magento 2 stores so far and growing. 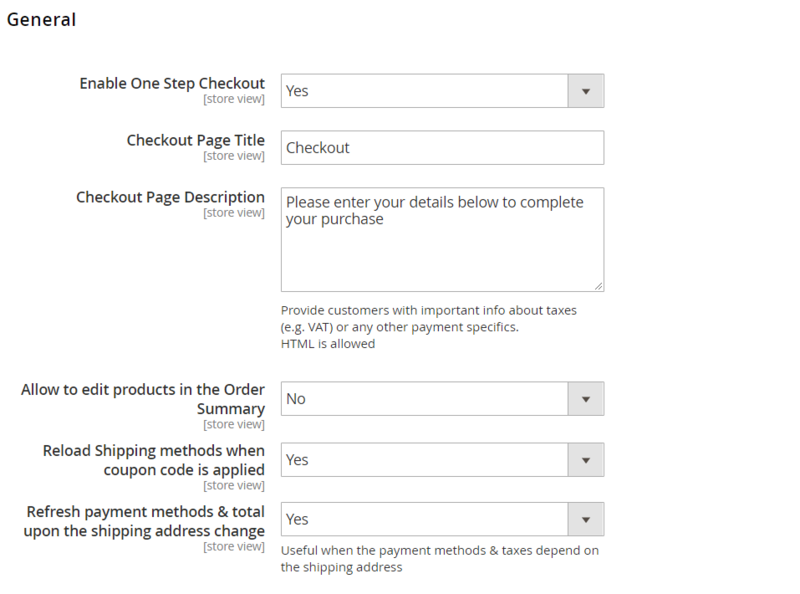 As a result, your Magento 2 checkout page is as compact as possible. Let’s start with some simple design customizations. 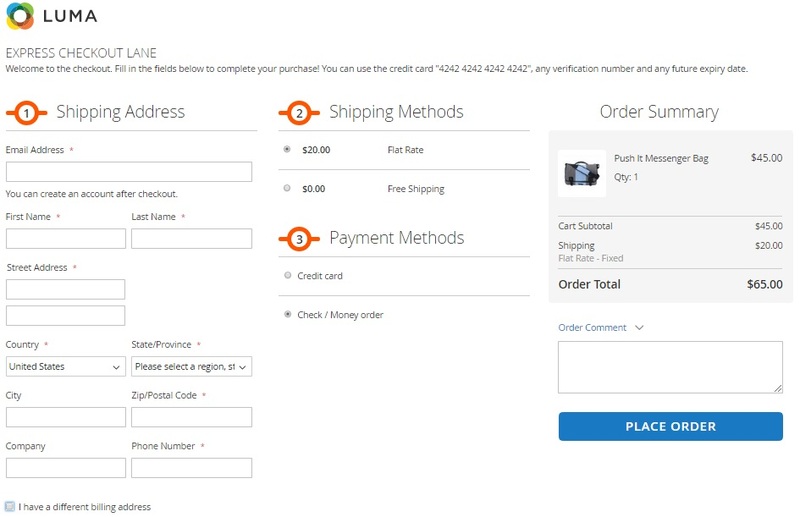 We know for sure that a reliable Magento 2 one step checkout extension should have enough options to let merchant implement custom design ideas. Therefore, let’s see what our participants offer. 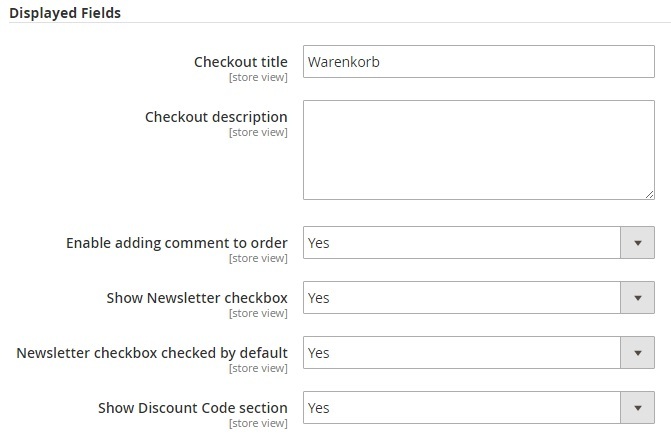 Amasty allows creating a custom checkout page title and description. Both options are available in the General section of the extension’s settings. 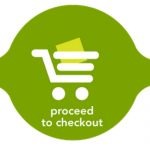 The same is about the Magestore Magento 2 one step checkout module. 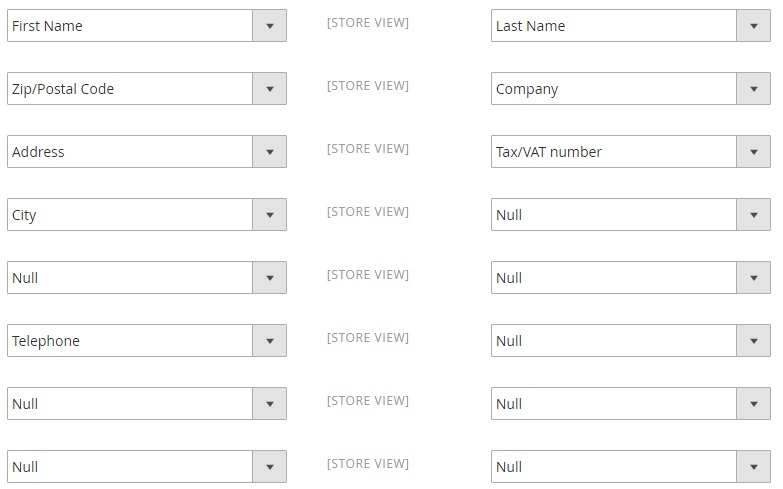 The corresponding fields are available in General Configuration -> Displayed Fields. Besides, Amasty offers a separate section for various design settings. 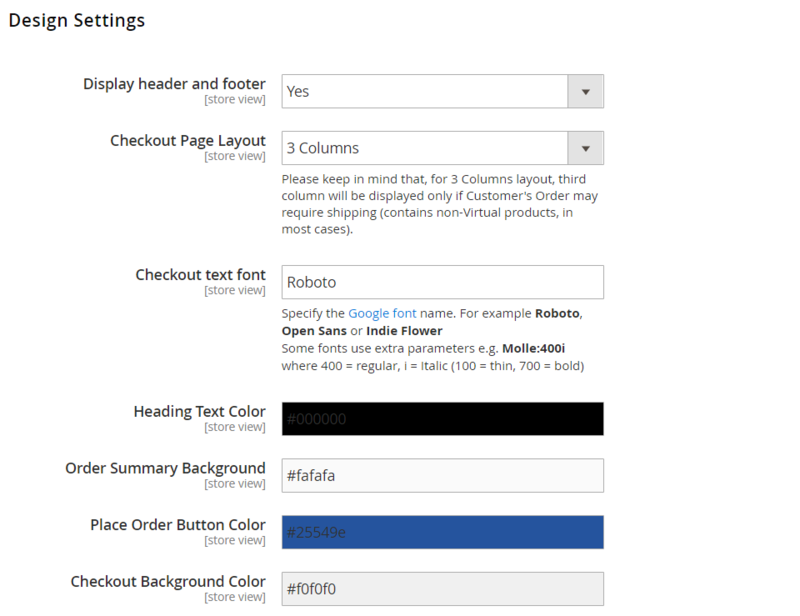 You can place header and footer on the checkout page, select between 2 and 3 column layouts, set checkout text font, and specify colors for heading text, order summary, place order button, and checkout background. 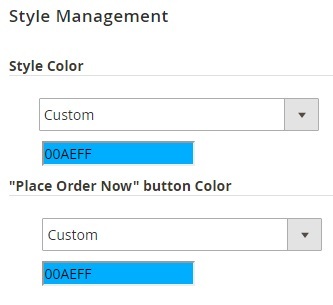 Magestore also offers a separate design section called Style Management, but it is limited in comparison with the one provided by Amasty: you can only change a style color and a “Place Order Now” button color. Besides, it is impossible to choose between 2 and 3 column layout: 3 columns are used by default. 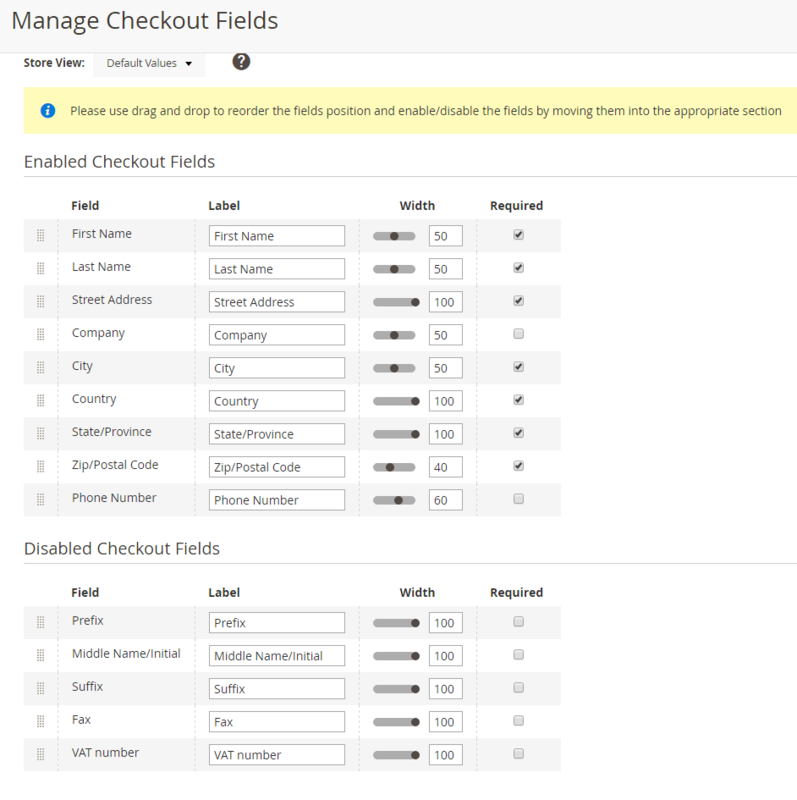 Although both extensions provide the ability to hide/show specific fields, the Magestore One Step Checkout Magento 2 extension has a quite simple Field Position Management section. It allows you to customize positions of fields in Billing and Shipping Address section, as well as display fields either into 2 columns or 1. Thus, you get the ability to hide/show specified fields and customize their positions in the Billing and Shipping Address section. Moreover, the module allows you to configure the length of the fields. As a result, you can display fields either into 2 or 1 columns. Editing the field labels as well as making the fields mandatory or optional is also possible. 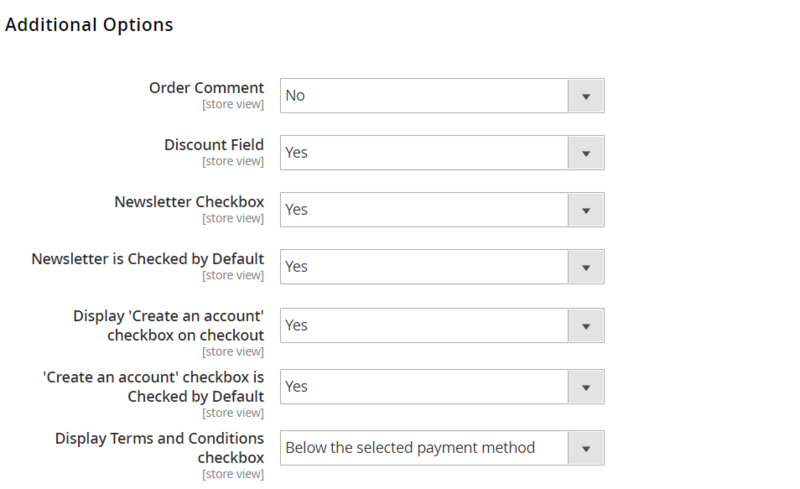 Besides, it allows you to show/hide some additional options like Order Comment, Discount Field, Newsletter Checkbox, ‘Create an account’ checkbox, and Terms and Conditions checkbox. 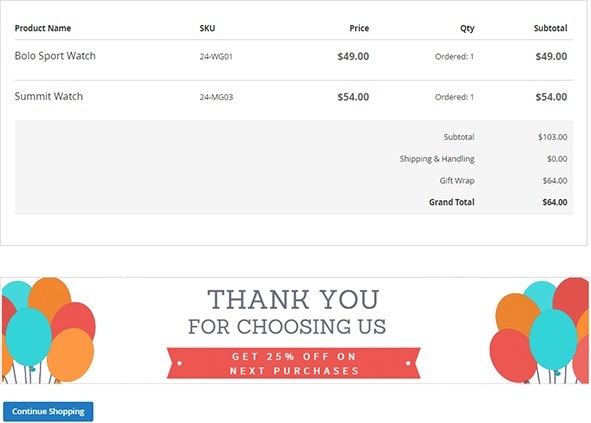 Besides, with this Magento 2 one step checkout extension, you can control the appearance of gift messages, enable gift wrapping, and charge gift wrap fee. 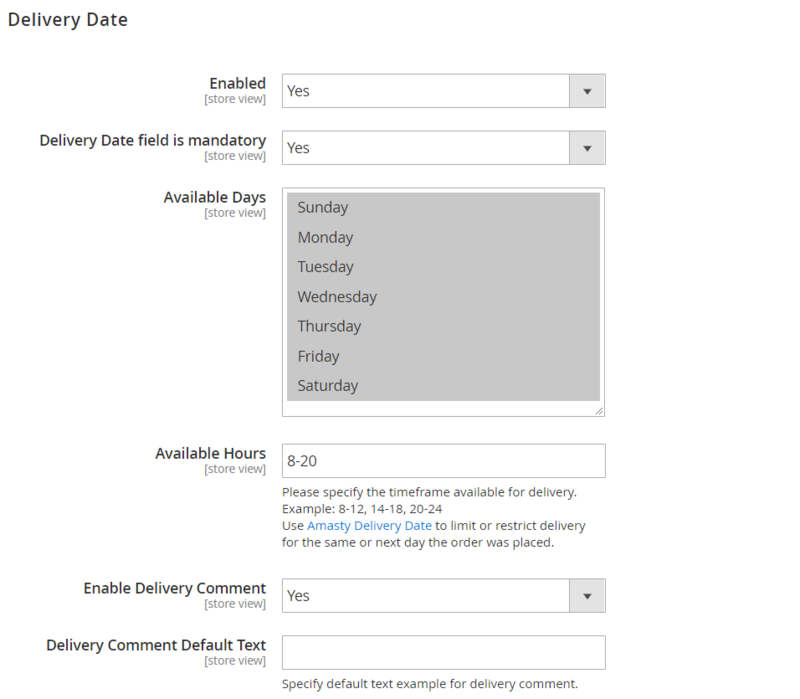 Also, the Amasty One Step Checkout Magento 2 extension allows you to activate the Delivery Date feature. 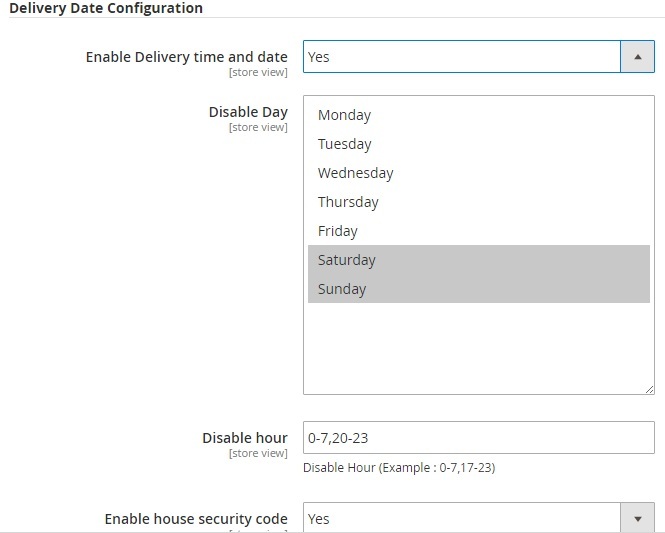 The Magestore Magento 2 one step checkout module also provides the ability to enable/disable delivery date in Delivery Date Configuration. It is also possible to hide product thumbnails in the Order Review section with the Magento 2 one step checkout extension by Magestore. Gift Wrap and Gift Message also have dedicated sections where you can hide both fields. Also, there is the Login Link Config section where you can disable it. The Magestore Magento 2 OSC module offers the same opportunities. 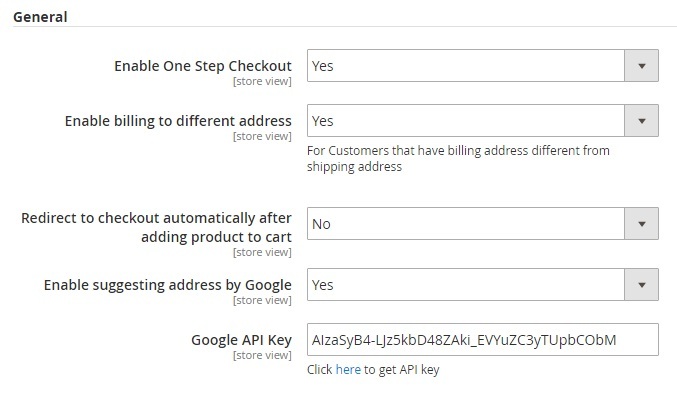 In case of geolocation, the Amasty Magento 2 one step checkout extension supports both Google Address Suggestion and Geo IP Location. 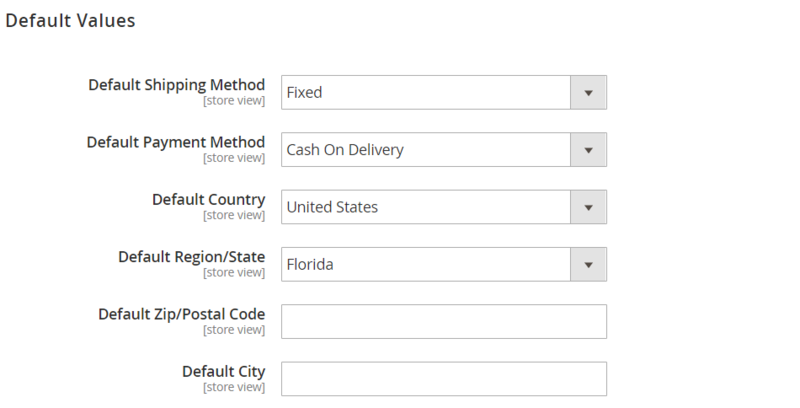 Similar options are available with the Magestore One Step Checkout Magento 2 extension. 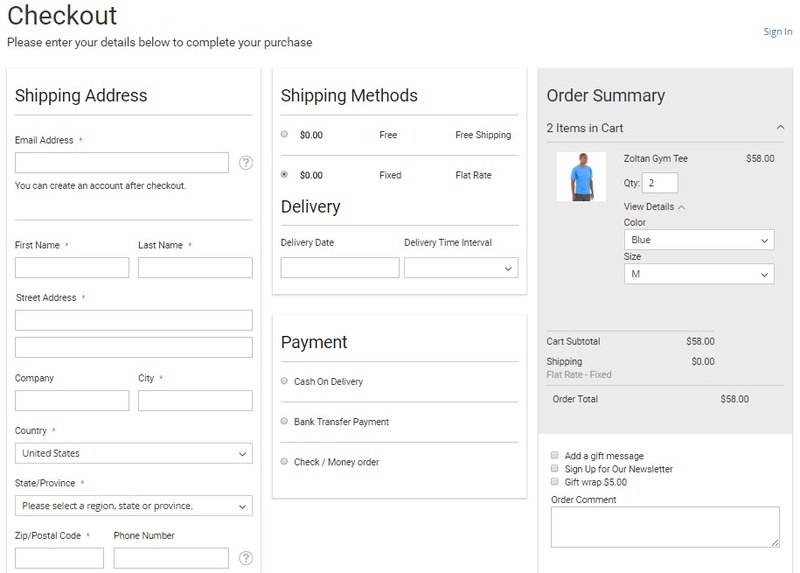 The Amasty Magento 2 one step checkout module allows you to edit configurable products, changing their size, color, or other attributes. Besides, it is possible to change product quantity at the checkout. In case of Magestore, it is only possible to change product quantity. At least, the demo section doesn’t provide the opportunity to change attributes. Amasty enables you to use CMS blocks on a success page. 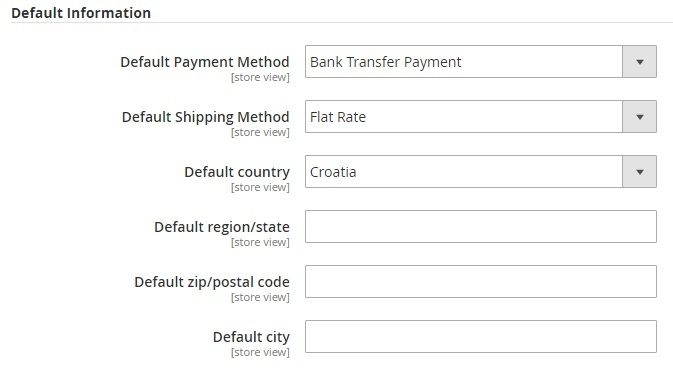 You don’t have this feature in case of the Magestore Magento 2 one step checkout module. Magestore OSC offers lots of other features. 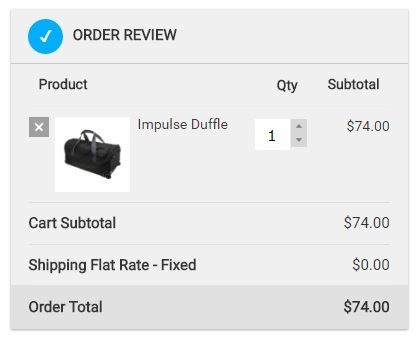 For instance, it is possible to enable/disable redirecting customers to checkout automatically after a product is placed to cart. Besides, there is the Admin Order Notification section. Now, when you know the difference in the backend functionality of Amasty Magento 2 One Step Checkout extension and Magestore Magento 2 One Step Checkout module, check their frontend appearance. You can purchase Amasty OSC for $249, while Magestore OSC is 50 bucks more expensive. Probably, this was the easiest comparison we’ve ever made. Both extensions have much in common, so it wasn’t difficult to discover key differences. So, in which situation should you use Amasty OSC, and when is Magestore OSC more suitable? If you are looking for a tool with a straightforward backend interface and advanced design options (2 layouts, various fonts and colors, CMS block for success page, and more), choose the Amasty Magento 2 One Step Checkout module.